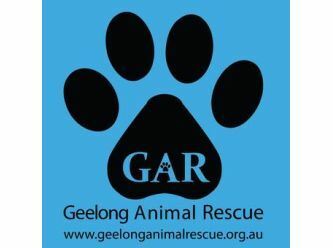 Geelong Animal Rescue GAR Limited is a registered non-profit organization. We volunteer our time, effort and resources because we are passionate about the rescue and rehabilitation for animals. Our mission is to be the voice of the mistreated, unloved or abused animals. We aim to provide compassion and quality of life for rescued animals via expert rehabilitation and ultimately rehousing into loving families. GAR has a 'no death' policy and will seek professional euthanasia only when in the best interest of the animal. Luther is a 14 week old black kitten. He is very athletic and able to jump up on most things with ease. He loves to be with people and other animals. He cuddles up with his foster siblings who are adult cats and large dogs. Luther is very quiet and you don’t realise he is next to you until you hear his loud purr. Not a lap cat but likes to be near. He has taken to sleeping on mum’s bed along with the resident cats. Luther is a real sweetie. He has enormous feet which he will grow into! A very lovable little man. All Luther’s vaccinations, desexing and micro-chipping are done and he has received worm and flea treatments. 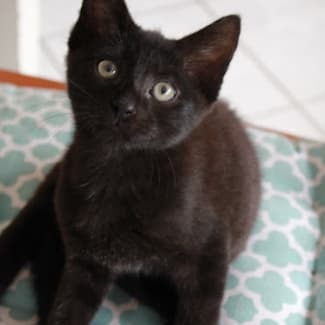 Luther is ready for his forever home. Meow, hello lovelies, I am Tiff. I love to play and climb as high as I can, I am not afraid of heights. I am so good at climbing; I can run and jump, grabbing on to your clothes so that I can climb up you to sit like a parrot on your shoulder. I will jump on your lap whilst you eat. I think my foster mum is rude as she will not share her food with me but I have been lucky on occasions as she will cook me rice and plain chicken (shredded) which is delicious. If only she would let me sit at the table with her. I will be your best buddy for studying; I like to type and grab your hand as you use that mouse (funny looking mouse though). I also love to watch you cook, clean but I am not sure about that vacuum cleaner but really I just love to be part of your family and everything you do. 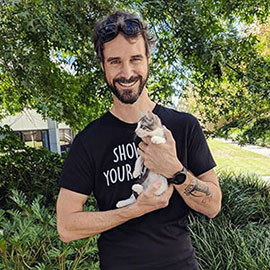 I am good with kids and other cats. 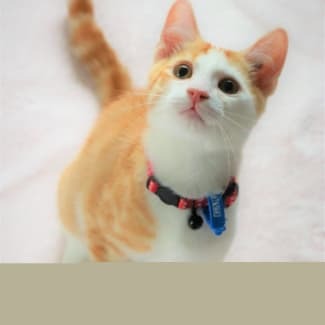 I am litter trained, microchipped, desexed, up to date with flea and worm treatments and full of personality and sweet. Hi potential forever family! My name is Domino! I am said to be a man of love. I love everyone and anything. That cup on the table? I will rub it to show my love. Your ankles? I love them. That cat scratcher? I love it. Anything and everything I will rub it to show my love. I will even roll around on the floor purring to show my love to you! Listen, I didn’t always know that I was loved. When I first came into foster care I was very timid and scared of everything. I didn’t move from my bed for 2 days! But my foster family let me know I was safe and loved by giving me lots of pats and feeding me super yummy treats! As soon as I realised I was in a safe place surround by love, I came out of my shell and became the man of love I am today! At first I didn’t realise what toys were but now I will play with anything! A piece of fluff, stuffing from a soft toy, shoelaces and even a dogs tail! Although I do love my cat beds, I much prefer a big dog bed to sleep in! I have already claimed the dogs bed in my foster home! I am quite the chatterbox when I want to be, especially when you first come home! In foster care I have been living with a cat and a dog. Obviously I love both of them, even if they don’t like me as much. I will rub them and roll around on the floor near them to show them my love! When I want to play I can get a little rough but just a clap of your hands and I will stop and will go do my own thing. I’m not much of a cuddler and am not a fan of being picked up, which my foster family thinks is due to not being picked or handled for most of my life. My foster family has been working on this and I will now happily sit next to you and sometimes on your lap! I’m still not a big fan of being picked up but I don’t freak out anymore when I do get picked up! 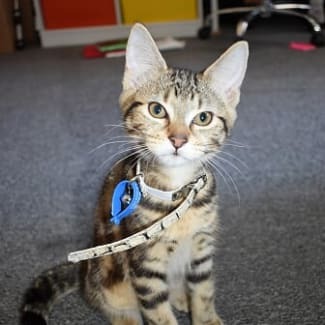 If you think I am the purrfect addition your family, then fill out an adoption application and hopefully organise a meet and greet! I promise you will fall in love with me. I am desexed, microchipped and up to date with all my vaccinations, flea and worm treatment. Hi! I’m Thorin! Like my brothers and sisters I’m a total lovebug! Snuggling up for a nap or cuddle is my favourite pastime, right along playing or chirping at birds! I’m very relaxed and equally social. I get along great with children and other cats, and I greet strangers at the door! 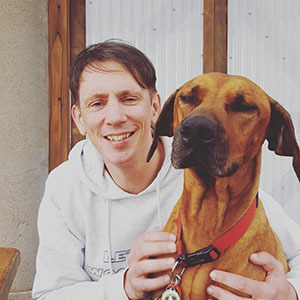 I don’t have much experience with dogs but I’m sure I’d get along great with a small cat-friendly dog or puppy! Naturally I’m litter-trained and very clean; I’ve never had an accident or missed the litterbox. I have a bend in my tail (likely from getting it caught in a door) so please don’t touch! I love being pet, cuddled, and smooched, I even like my belly being rubbed but please stay away from my tail. During Summer I like to sprawl out on the kitchen floor or relax in front of the aircon. In winter you can find me snuggled up in my bed, curled up next to the heater, or cuddled up in your lap under the blankets. Even if you’re not around during the day I’m fine on my own. Leave me food, water, a few toys, and a couple of windows to look out and I’ll keep myself entertained until you come home. I can’t wait to meet you! 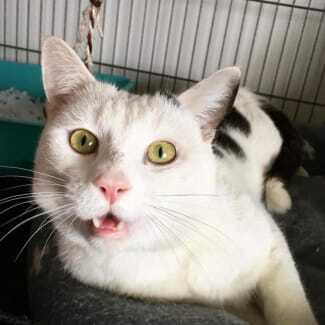 Thorin is desexed, microchipped and up to date with vaccinations and flea and worm treatment. Mouse is a small cat with a big personality. He’s curious and interested in what you do, and makes a great companion. He likes to hangout with you, especially in the bathroom (he loves to drink from the running tap and doesn’t mind a bit of water on him). 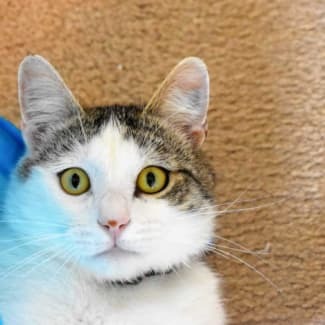 He still has his kitten playfulness, and loves to play with toys, and will keep you entertained for ages. After a good play session, he’ll curl up next to you and enjoys a good head rub. If you’ve been gone, he’ll be the smooochiest boy around when he sees you again! He might even fall right off the couch or bed because he’s rolling around trying to get your attention, he’s so happy. Due to his kitten-like playfulness, he still has a few manners to improve. When playing, he sometimes forgets that limbs and hands are not toys and can get a bit rough. For this reason he might not be the right fit for a home with young children. He’s a playful smoocher, and will make a lucky person a great companion. Mouse is desexed, vaccinated and up to date with flea and worm treatments.